Profits are up after the PMC employed a bold marketing move for their season five opener. Last week we brought you the story of the Pasadena Master Chorale’s bold new “listen first, pay later” policy. The experiment allowed audiences to experience the concert first, then afterwards pay what they thought it was worth. We were a little skeptical of the plan, which could have been a major money-loser, but we’re happy to report that the PMC season five opener, A Portrait of Benjamin Britten, was a smashing success. The PMC reports that they exceeded the expected revenue for last Saturday’s concert by a whopping 50%. A Portrait of Benjamin Britten was performed in front of a nearly full house at the Altadena Community Church, and the PMC estimates that on average, patrons paid $24.70, a significant increase compared to ticket revenue at regular performances. 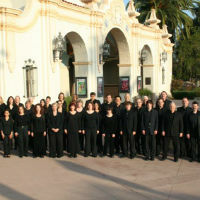 We tip our hats to the creative marketing and wish the Pasadena Master Chorale a prosperous season. Is the Future of the Santa Monica Pier Summer Concert Series at Risk?